Rudolf Krügener (* 8 December 1847 in Elberfeld; † 22. September 1913 in Dresden) was a chemist who led a branch of Agfa in Frankfurt am Main. Since he was handicapped, wearing a self-made leg prosthesis, he developed for himself (with the help of a master mechanic named Krücke) the Dr. Krügenersche Taschenbuch Kamera (Dr. Krügeners's pocketbook camera), one of the smallest cameras of its time, with dimensions of 45×100×140mm. A novelty was the magazine for 24 plate exposures. It was an economic success. The next magazine camera was the Simplex, which had a smart plate exchange mechanism inside and an extra lens for the mirror finder. 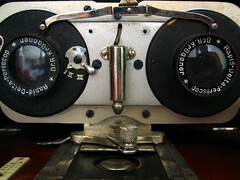 It can be seen as predecessor of the twin lens reflex cameras. 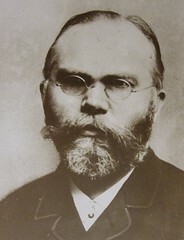 Krügener founded Dr. Rudolf Krügener, Photochemisches Laboratorium und Fabrik photographischer Apparate Frankfurt-Bockenheim, a company that produced lenses, photo chemicals and cameras. He expanded the company with a plant in Furtwangen. His company produced 100 camera models and kept up with technology. Dr. Krügener favoured the film plate format 9×12cm . Around the time of the merger of the company with others to ICA, his sons became managers there: Walter Krügener as boss in Furtwangen, Dr. Hermann Krügener a director of ICA. Krügener's Patent Book Camera sold by Marion in England, c.1890. 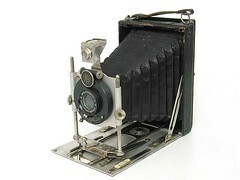 Delta 9x12cm folding plate camera, 1900s. This page was last edited on 27 September 2017, at 05:17.